Community feedback a large factor. Rocket League developer Psyonix is considering the possibility of bringing the game to the Nintendo Switch. Speaking with IGN, Psyonix vice president Jeremy Dunham stated that the decision would be influenced by community feedback. "Just like all the other platforms, we are evaluating it. We're looking to see what the technical requirements are," Dunham said. "We're looking to see what kind of true community demand there is. We're looking to see how it would benefit the community as a whole. So we're still in that evaluation phase. It's definitely too early to say that it wouldn't happen, but it's also definitely too early to say that it would." "I think we've shown over time we're a community based company, and so what we're doing first is seeing what kind of impact that would have and who needs it and who wants the game and we'll go from there," Dunham continued. "Luckily the platform's only been out for a month, so we have plenty of time to look to see how it's doing and what our audience wants." 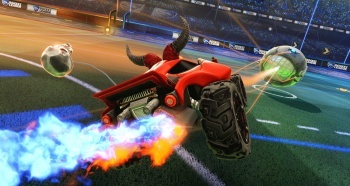 Rocket League released for PlayStation 4 and PC in July 2015, and Xbox One in February 2016.